Diana J. Burgess, et al. (2014). "Culture, acculturation and smoking use in Hmong, Khmer, Laotians, and Vietnamese communities in Minnesota." BMC Public Health, 14, Published Online. This study assesses how tobacco use patterns in Minnesota’s Southeast Asian communities have been shaped by culture, immigration, and adjustment to life in America in order to inform future tobacco control strategies. Tracy Carpenter-Aeby, Doaw Xiong & Victor G. Aeby. (2014). "Comparing the Health Locus of Control among Caucasian and Hmong College Students." Journal of Human Behavior in the Social Environment, 24(5): 635-642. This study compares the health locus of control among Hmong and Caucasian students in Western North Carolina using the Multi-Dimensional Health Locus of Control Scale. College students participated anonymously by email and social media utilizing a web-based survey. Tracy Carpenter-Aeby, Victor G. Aeby, Shauna Daniels & Doaw Xiong. (2014). "From Detention Camps of Thailand to Freedom in the Foothills of North Carolina: One Family’s Remarkable Story." Journal of Family Social Work, 17(4) 363-378. This article examines one family’s efforts to preserve the oral history of the Hmong culture and to promote understanding across generations and community members from different cultural backgrounds. Meaghan Gartner, Lisa Kiang and Andrew Supple. (2014). "Prospective Links Between Ethnic Socialization, Ethnic and American Identity, and Well-Being Among Asian-American Adolescents." Journal of Youth and Adolescence 43:1715–1727. This study assesses the relationship between socialization, ethnic identity and American identity, self-esteem and depressive symptoms among Asian-American adolescents including Hmong. Jeremy Hein. (2014). "The Urban Ethnic Community and Collective Action: Politics, Protest, and Civic Engagement by Hmong Americans in Minneapolis-St. Paul." City and Community 13(2): 119-139. This paper examines political, social movement, and civic collective action of Hmong Americans in Minneapolis-St. Paul through a content analysis of events reported in one of the community’s ethnic newspapers from 2002 to 2011. Jeremy Hein & Nengher Vang. (2014). "Politicians and Social Movements: The Impact of Electoral Victory on Local, National, and Transnational Activism by Hmong Americans in Minneapolis–St. Paul." Social Movement Studies: Journal of Social, Cultural and Political Protest, Published Online. This paper investigates the impact of two elected Hmong American officials in Minnesota on social movement campaigns in their community during their time in office. The researchers used content analysis of newspaper reports to create a sample of nine local, national, and transnational social movement campaigns in the community; and assess the ways the elected officials supported the campaigns. Jacob R Hickman. (2014). "Ancestral Personhood and Moral Justification." Anthropological Theory 14(3) 317–335. The author of this article assesses the theoretical relationship between the concepts of morality and personhood with an emphasis on an exegesis of a Hmong model of ancestral personhood and its relationship to moral discourse. Laurie L. Meschke and Christina R. Peter. (2014). "Hmong American Parents’ Views on Promoting Adolescent Sexual Health." American Journal of Sexuality Education 9(3): 308-328. The authors of this study examined Hmong American parents’ attitudes about adolescent sexual health using survey data from 202 parents of adolescents with particular attention given to parental gender differences in attitudes. Annie L. Nguyen & David W. Seal. (2014). "Cross-Cultural Comparison of Successful AgingDefinitions Between Chinese and Hmong Elders in the United States." Journal of Cross-Cultural Gerontology 29:153–171. This study investigated the definitions of successful aging according to Chinese and Hmong elders living in Milwaukee, WI. The authors' findings indicated some similarities in the Chinese and Hmong elders’ definitions though specific cultural differences exist. Louisa Schein & Bee Vang. (2014) "The Unbearable Racedness of being Natural: A Dialogue on the Gran Torino Production between Lead Actor Bee Vang and Louisa Schein." Cultural Studies, 28(4): 561-573. This article involves a dialogue between actor Bee Vang and anthropologist Louisa Schein. The authors discuss the dynamics by which the contemporary racial order is engendered and reproduced through the micropractices of film production from casting, to on set, to the reception of the resulting film text and also reflect on insights they have gathered from two years of collaboration. Adam Sposato. (2014). "Word order in Miao-Yao (Hmong-Mien)." Linguistic Typology 18(1): 83-140. Relying primarily on recently published Chinese descriptions, the author of this article presents data on fourteen word order features for eleven Miao-Yao languages for use in large-scale typological studies. The article also discusses two typologically unusual word order feature values which have been claimed to be largely or entirely restricted to Sinitic, but which are actually also commonly observed in Miao-Yao. Nicholas Tapp. (2014). "Religious Issues in China's Rural Development: The Importance of Ethnic Minorities." The Asia Pacific Journal of Anthropology, 15(5): 433-452. This author of this paper considers Chinese religion in relation to the changing nature of rural society and modernization in China. The author also includes aspects of ethnic minority religion and its renewal with reference to the ethnography of the Hmong, to show that minority religious issues can also reflect broader religious issues in China. Hmong Embroidery is a limited edition commemorative program book for the 2013-14 Hmong Embroidery Community Exhibit, a partnership of the Hmong Cultural Center and the Hmong Archives, supported by the National Endowment for the Arts, the City of Saint Paul Cultural Star program, UCARE and the Travelers Arts and Diversity Committee. 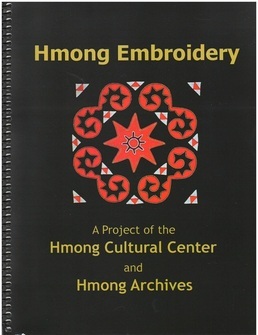 The unique 146 page book includes beautiful color photos of 121 Hmong embroidery artworks including in the community exhibit along with narrative descriptions of each artwork including information about the artist, style of Hmong embroidery, techniques used and the cultural significance and meaning of the artwork. Featured Hmong embroidered artworks come from Laos, Thailand, Vietnam, Germany and the United States. 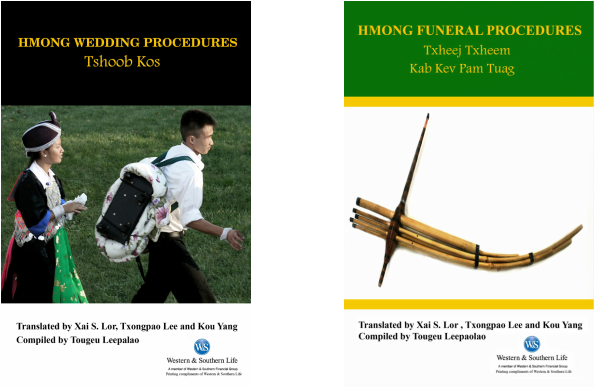 How to Order the Books: Visit http://www.hmongcc.org/hmong-weddingfuneral-books.html or the Hmong Cultural Center offices in Saint Paul to order copies of Tshoob Kos (Wedding Procedures) and Kev Cai Pam Tuag (Funeral Procedures). Individual copies are $12.00 a piece if picked up at the Hmong Cultural Center or $15.00 if ordered online. A check in the amount of $15.00 or $30.00 for both books may also be mailed to Hmong Cultural Center, 995 University Avenue, Suite 214, Saint Paul, MN 55101. Institutional Purchase Orders are accepted and may be mailed or faxed to 651-917-9978. Please allow 3 to 4 weeks for delivery.